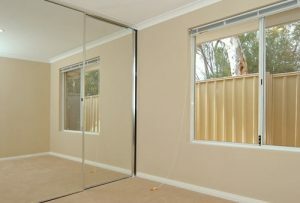 If you are looking for splashbacks in Perth, Dial-A-Glass has just the thing for you! 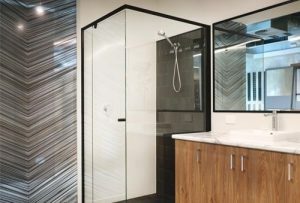 We offer a wide range of high-quality glass splashbacks made right here in Wangara, including mirror splashbacks, coloured splashbacks in a variety of shades, metallic painted splashbacks, and even digitally printed splashbacks. 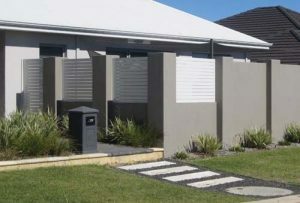 Most people agree that investing in home elements which are both practical and attractive is money well spent. When it comes to designing or redecorating your kitchen, there is a wide variety of different options which are designed to be low maintenance while making the space really pop out – and splashbacks are one of them. Regardless of what kind of style you choose for your home, our splashbacks will go with pretty much anything. We go the extra mile in designing them to both save your walls from nasty stains and watermarks, and to make your kitchen space appear more stylish and appealing! 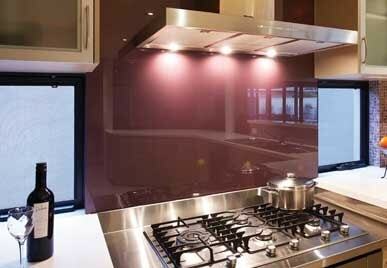 All of our splashbacks are made from the highest quality toughened safety glass. 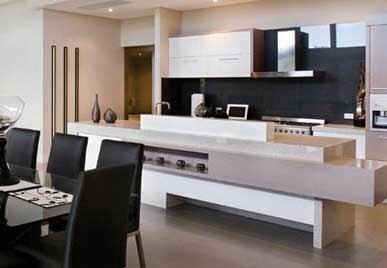 This type of splashback uses our Miralike surface to give a very high-end look. 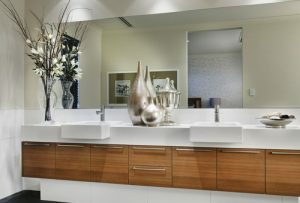 These come in a variety of finishes, best appreciated by visiting our showroom. This is a great value product and desirable for those who love the slight green hue given by this natural surface. 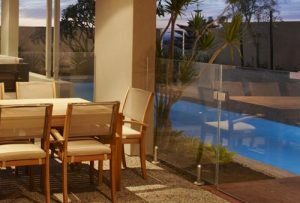 Low iron is a ‘clearer’ glass than float glass which makes painted colours brighter and whites – whiter. 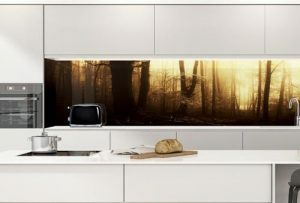 All of the above splashbacks are made of top quality materials which are guaranteed to last (see our warrantee), and you can choose whether you want them colored, ultra white, or digitally printed, depending on your preferences. 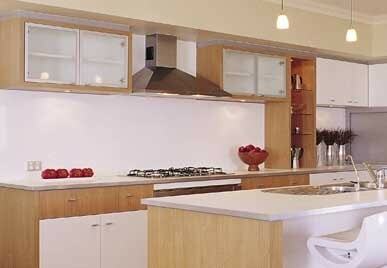 For instance, if you are a fan of the minimalist aesthetic, we suggest you go for ultra white splashbacks. 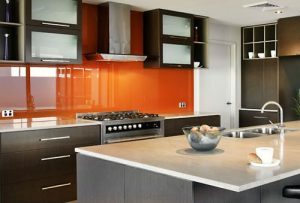 On the other hand, if you prefer a more traditional style, you can’t make a mistake if you choose a simple coloured splashback or one made of float glass. 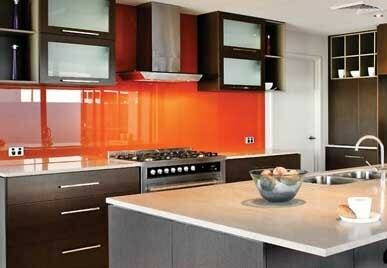 While splashbacks can be made of different materials such as tiles, pressed metal, steel, and glass. 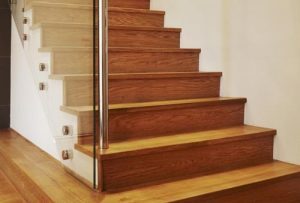 Glass is by far the best option to go for, because it can match basically any colour and style, it has reflective characteristics, and it is easy to maintain! While tiles can undoubtedly look amazing, especially when it comes to traditional kitchens, they require a lot of work in terms of cleaning, and some stains can be impossible to remove. The color of your splashback should match the colors of your kitchen or be a centre showpiece that grabs the attention depending on your personal style. If you’re renovating to sell the property It’s usually best to choose something that compliments the benchtops and kitchen cabinets. If you want your space to be more colorful and you already have a neutral benchtop, it’s a great idea to choose some contrasting color for the splashback to break the color monotony. 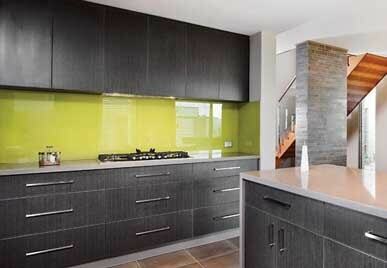 Mirror splashbacks can bring more brightness into your kitchen space. 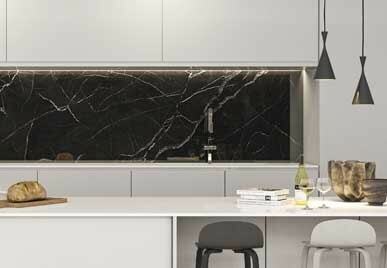 Our range of miralike products have a beautiful finish offering a modern, deep reflective splashback.